Not the actual record pizza, but a pretty wonderful cheese shot nonetheless. We will never tire of bringing you cheese news. Or pizza news. Or record-breaking, 154-cheese-topped pizza news. 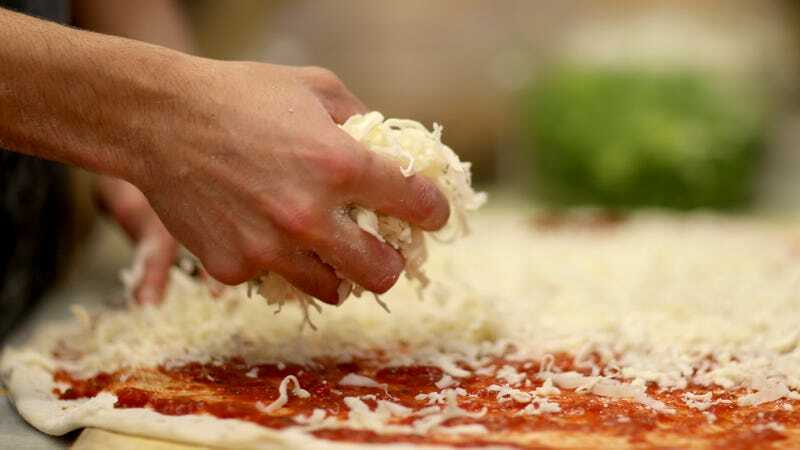 Guinness World Record announced it has certified a new record-holder for Greatest Variety Of Cheese On A Pizza, held by Australian pizzamaker Johnny di Francesco of Melbourne’s 400 Gradi restaurant. Di Francesco broke the previous record, which stood at 111, with this pie covered in 154 varieties of cheese. He first created the pie in September 2018. But what’s even more impressive is that 400 Gradi actually served hundreds of these pies to customers. How? Di Francesco used merely a gram of each type of cheese for the prototype pie. He then melted down the remaining blocks of all those cheeses, reformed them, and created a single massive block that contained those 154 cheeses, which could be grated onto individual pies. Let’s take this time to pause and consider the existence of a Cheese Megazord. Yes, that was a Mighty Morphin Power Rangers reference; do not adjust your screens. 400 Gradi sold a total of 797 of these pies in five days before depleting their cheese supply. It was listed on menus as simply “Cheesy Pizza,” which seems like something of an understatement. Di Francesco told Guinness World Records he knew he could break the record because he’d previously succeeded with a 99-cheese pie a few years ago. Anyone upset over missing the chance to order such a concoction can comfort themselves with the hope that di Francesco will one day attempt to break his own record.